The first phase of Bega Valley Shire Council’s biggest consultation is coming to an end early next week with the next phase starting later in the year. More than 1400 people have taken the Understanding Our Place survey so far in towns and villages throughout the Shire. 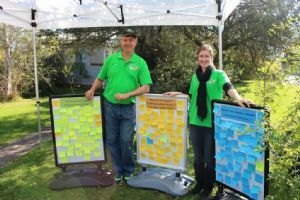 Council’s Integrated Planning and Reporting Coordinator, Rebecca Bogie, said there had been lots of positive feedback from the community about the volunteer Council staff who’ve been out on weekends and evenings asking important questions about the Shire’s future. “We have gathered very useful feedback from the engagement activities and listening posts that have been held at local markets, in the CBD’s and at community hall meetings,” she said. “The next phase coming later this year is the ‘targeted’ consultation which will consist of focus group meetings to discuss and develop community ambitions on key issues and themes within our community. “We will be inviting focus group representatives to discuss issues such as health, education, agriculture, accessibility and much more. “The current survey is available on the Have Your Say page on Council’s website and closes on Tuesday 31 May 2016, so don’t miss out on telling us about your community,” Ms Bogie said. For more information, or if you would like a hard copy of the survey, contact Council on 6499 2222. Photograph: Council staff, Scott McNeil and Erin Kluit volunteering at the Cobargo listening post.